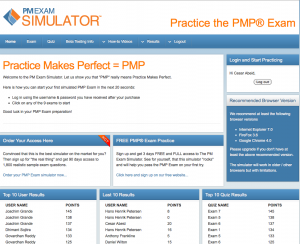 As I mentioned on my previous post, I am currently beta-testing the PM Exam Simulator which will be released on Friday, March 25, 2011. The product promises to create an environment similar to the real PMP exam while providing the student with hundreds of good quality practice questions. When I was preparing for my exam, I had difficulty finding enough good practice questions to answer. There are many free questions out there on the internet, but they tend to be low quality and not reflect real PMP exam questions. There are also questions you can buy, but the price was prohibitive in many cases. This product will deliver literally thousands of practice questions and an exam simulator which is very close to the real thing. As a former student myself, I really wish I had a tool like this one when I was preparing. As usual, Cornelius provides the PM community with yet another great product, and that is why I chose to become a compensated affiliate for this product.